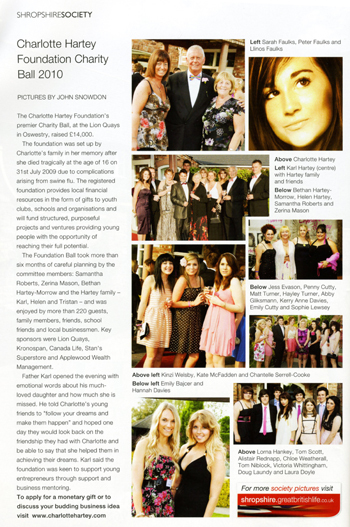 The Charlotte Hartey Foundation held it's premier Charity Ball on Friday 21st May 2010 at the Lion Quays in Oswestry and is proud to announce that a generous £14,000 was raised during the course of the evening. The Foundation Ball took over six months of careful planning by the committee members Samantha Roberts, Zerina Mason, Bethan Hartey-Morrow and the Hartey family - Karl, Helen and Tristan and was enjoyed by over 220 guests, family members, friends, school friends and local businessmen. A big thank you goes out to key sponsors, Lion Quays, Kronospan, Canada Life, Stans Superstore and Applewood Wealth Management for helping make the evening one to remember. Karl opened the evening with emotional words about his much loved daughter Charlotte and how very much she is missed, as a family member and a friend. 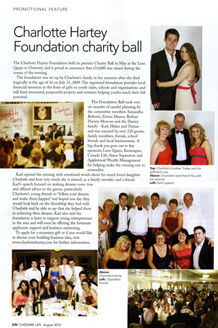 Karl's speech emphasised on making dreams come true and offered advice to the guests, particularly Charlotte's young friends to "follow your dreams and make them happen" and hoped one day they would look back on the friendship they had with Charlotte and be able to say that she helped them in achieving their dreams. Karl also expressed the foundation is keen to support young entrepreneurs in the area and will soon be offering the fortunate applicants support and business development grants. The weather was not the best! 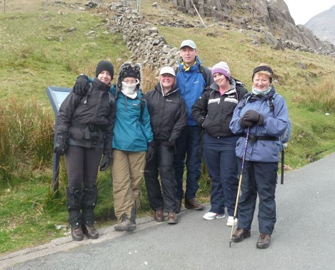 But, we are very happy to have been able to part cycle and part climb Snowdon on Saturday 4th December. 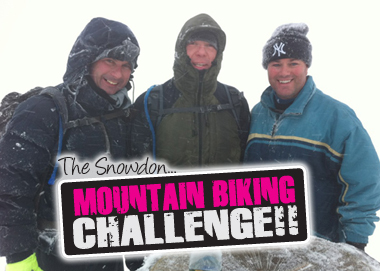 Battling against heavy sleet, snow and freezing weather conditions Karl Hartey, Stuart Jermy and Paul Seager managed to summit at 2pm after a 3.45 min climb. Karl Hartey said "We are very please to have been able to have raised £2567.78 through our just giving donations and the kind generosity of the people who donated." 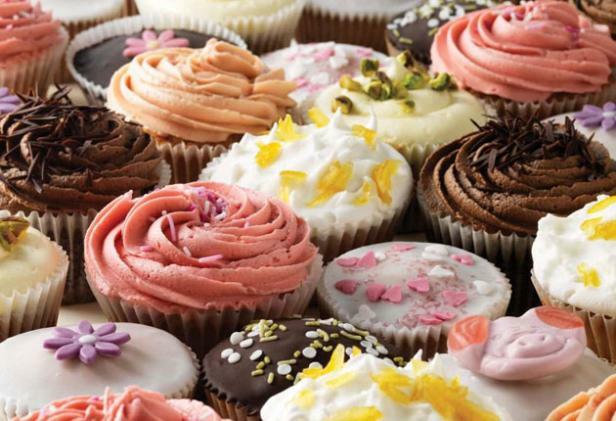 We would like to say a huge thank you to Annie, Jade and Lucy for raising £302 as part of the Duke of Edinburgh Challenge after baking hundreds of cakes. An extra thank you goes out to the dinner staff and teachers for helping make this event happen. Thank you so much for you donation. Massive thank you to Ben Richards for running the Gosport half marathon in a fantastic time of 1.40mins and raising a grand total of £225. We would like to thank Claire (crumbilicious) for organising such a successful and well orgainised event, and to all the stall holders that attended. Bellan House School was alive with independent traders selling all kinds of wonderful merchandise from table bags to fine jewelry and wonderful photographic prints. We are very grateful for the fantastic donation and thank you all kindly. 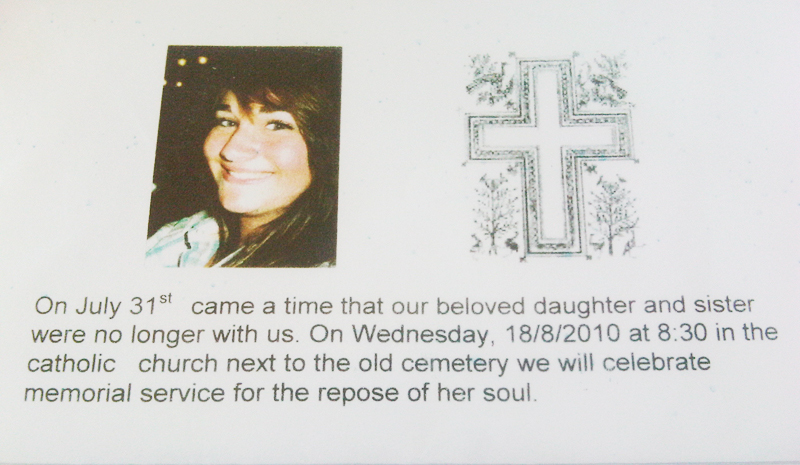 A church service took place on the 9th October 2010 at St. John's Parish Church to commemorate Charlotte' birthday. 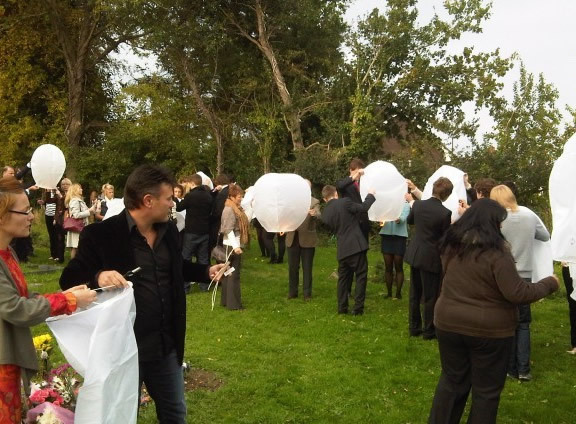 Over 80 close friends and family members gathered to celebrate Charlotte's life. At the end of the Church service Chinese Lanterns were released to pay respect. Karl, Helen and Tristan will be joined by the local community in Kos, Greece on 17th August 2010 for a small church service to pay their respects to Charlotte who was much loved by the local residents and commemorate her tragic passing. We would like to thank Sean Vallely for raising £3,330 in sponsorship by completing the Great North Run in a brilliant time of 2hrs 3mins. 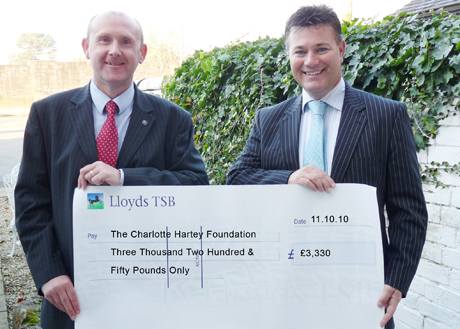 This a fantastic personal achievement and we truly appreciate the donation. We would like to thank all the recent clients and guests who enjoyed the hospitality of Applewood Wealth Management during an Appreciation Evening on the 20th July 2010 and raised a grand total of £620.50 from donations, the Raffle and Heads & Tails. We are pleased to congratulate the group on successfully braving the weather on Saturday 8th May, and reaching the summit of Snowdon. The climb took 6hrs in total and raised £112 for the foundation. 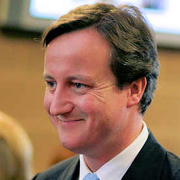 Conservative party leader David Cameron has backed a Shropshire father who is campaigning for a halt to over-the-phone swine flu diagnosis In an e-mail to Mr Hartey, Mr Cameron said: "When it comes to swine flu, I do think that more could have been done to stop confusion spreading among GPs and the public about what was happening – particularly about when antiviral drugs should be prescribed, when GPs should see people in the surgery or at home, and in what circumstances they could rely on diagnosing someone over the phone". 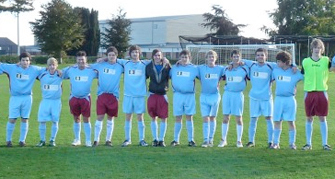 We would like to thank every one kindly for their support on Monday evening - excellent turn out! 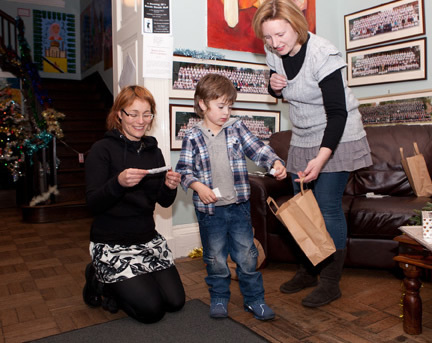 A grand total of £133 was collected. A special thank you to both, Elis for his homemade rice crispy cakes (Yum yum!) and John for kindly donating cookies and cakes from at Milanos which kept the side line content while watching the game. Sadly CHF lost to game 6-0. This was no reflection as to the performance of the team, as the game was end to end stuff with many narrowly missed chances from the foundations strikers! In the first half alone there were three blinding efforts and a missed penalty, All we can say is that we have improved on last years result and are definitely looking for the win next year!